alf centuries from Vishal Kissoon and Vickash Dhaniram, host Zeelugt Sports Club defeated Rising Star by 41 runs. Zeelugt SC managed 174-6, batting first with Kissoon and Dhaniram scoring 69 and 62 respectively. Christian Husbands, Shaquille Brisport and Travis Smith took two wickets each. Rising Star were bowled out for 133 in reply. Brisport made 34 and Shane Persaud 29; Alim khalil had 3-2 while Tamesh Dass picked up 2-24. At Canal Number Two, Dynasty CC overcame Mc Gill Sports Club by 30 runs. Dynasty CC posted 175-6, taking first strike. Safraz Esau struck 40 while Ryan Shun made 36; Keshram Seyhodan had 2-28. Mc Gill SC threatened somewhat before they were sent packing for 145 in response. 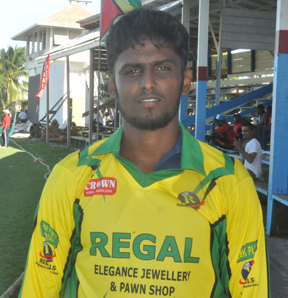 Daniel Basdeo made 48 and Travis Persaud 20; Ricky Persaud snared 3-18, Brian Persaud 3-20, Reaz Khan 2-12 and Shun 2-26. The competition continues on Sunday with Zeelugt SC hosting Dynasty A, Cold Fusion travelling to Meten-Meer Zorg, Christ Ambassador facing Mc Gill at Canal number Two and Dynasty CC B versus Chris Ambassador B at Zeelugt.